Both Howard and I deeply appreciate the exquisite compote you and Mr. Charlton were good enough to send us. Accept our sincere thanks both for the gift and your generous good wishes. - from The Etiquette of Letter Writing, copyright 1927, Eaton, Crane and Pike Co. Finally, add a closing sentence that is more personal. Thank you for the elegant serving tray. We look forward to using it when we entertain in our new home. We hope you and David will visit when you are in town next month. Thank you for hosting my family last weekend. You made us feel so welcome and it was wonderful to catch up. We look forward to having you stay with us over the holidays! 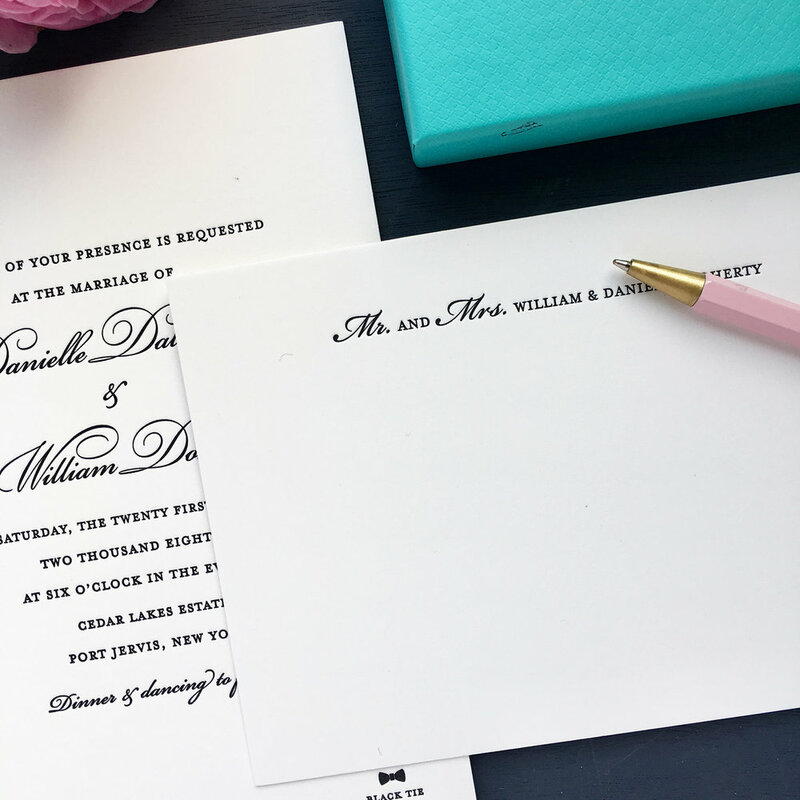 As also stated well in The Etiquette of Letter Writing, “In our hurried days graciousness is all too rare, but its rarity gives it increased importance and makes it doubly welcome”. We wanted to wish a belated congratulations to Blair & Stephen on their Lake Tahoe wedding this summer! 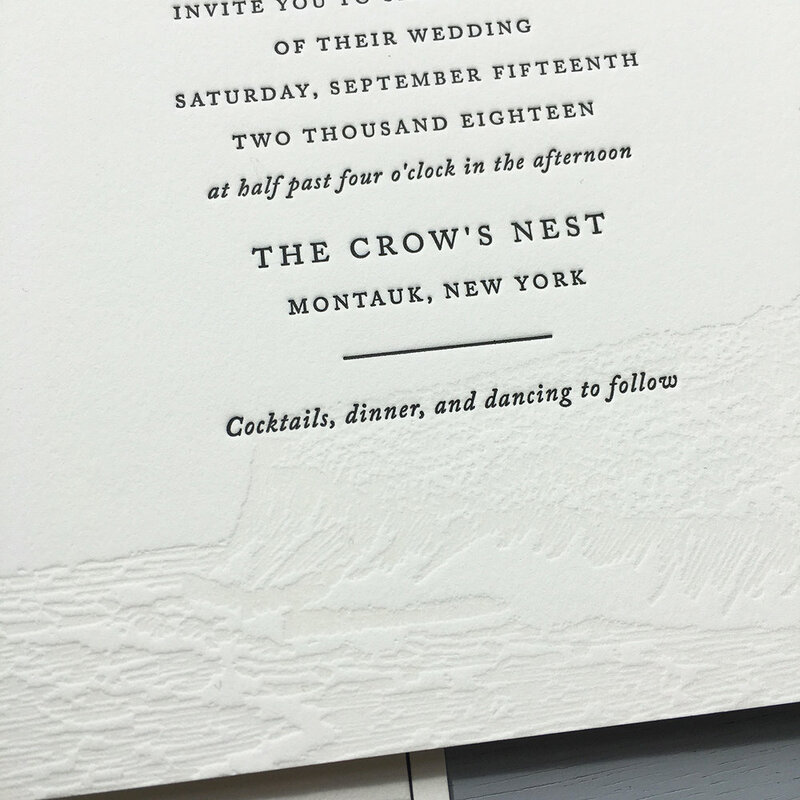 They're invitations were beautiful and simple in charcoal gray with clean text and some Tahoe inspired imagery. 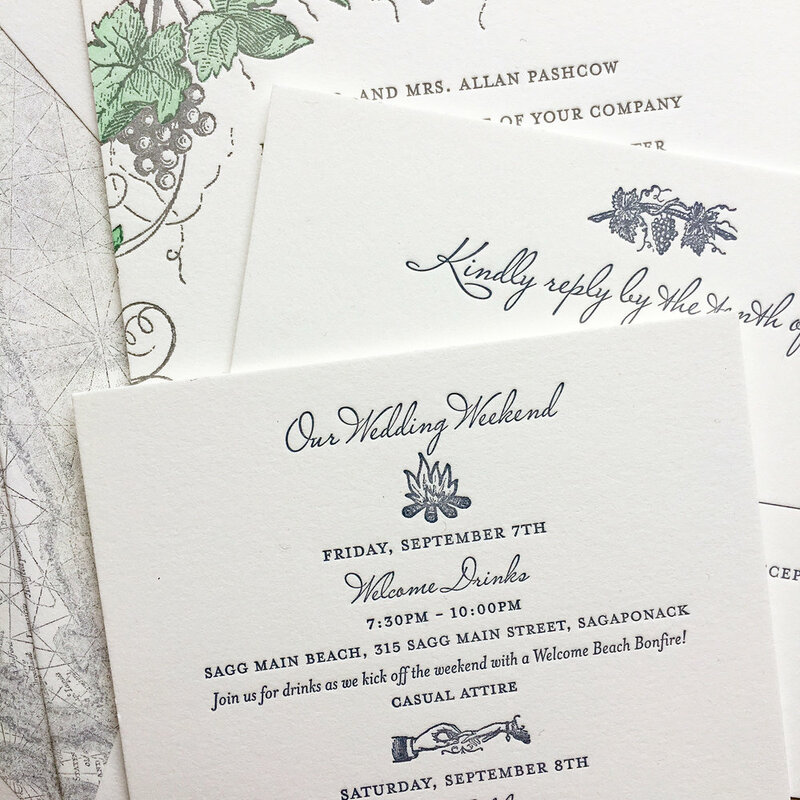 The pine tree and mountain illustrations were perfect for their cards. Congratulations to Sarah and Dan on their wedding this weekend! 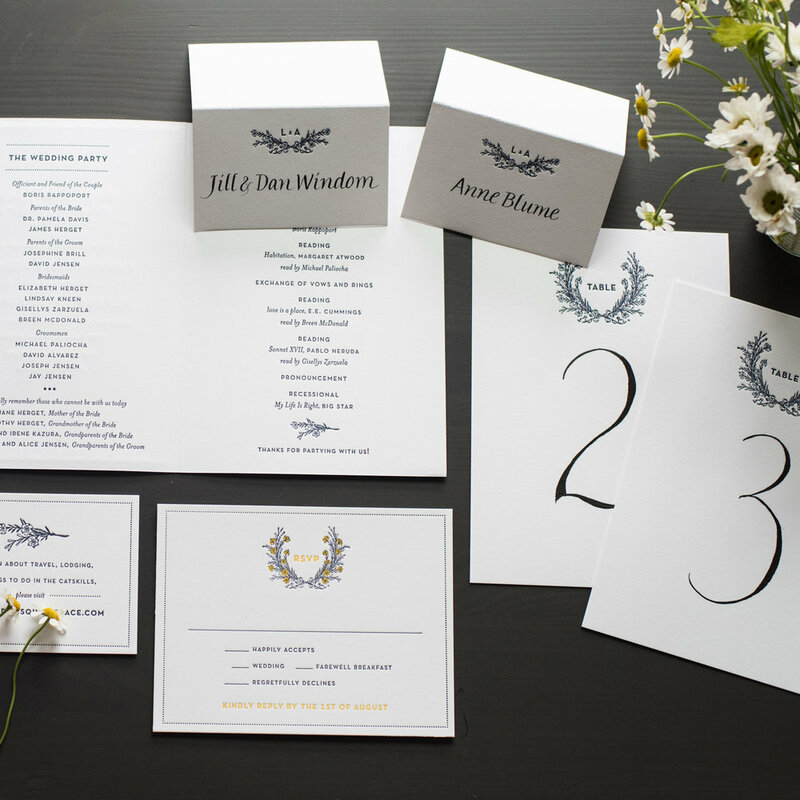 We loved working with them on their simple and sweet invitation set. They wanted to add illustrations to each of their cards to show off the theme of the event, like the lobster on the welcome dinner card and coffee on a farewell breakfast card. What a perfect weekend! 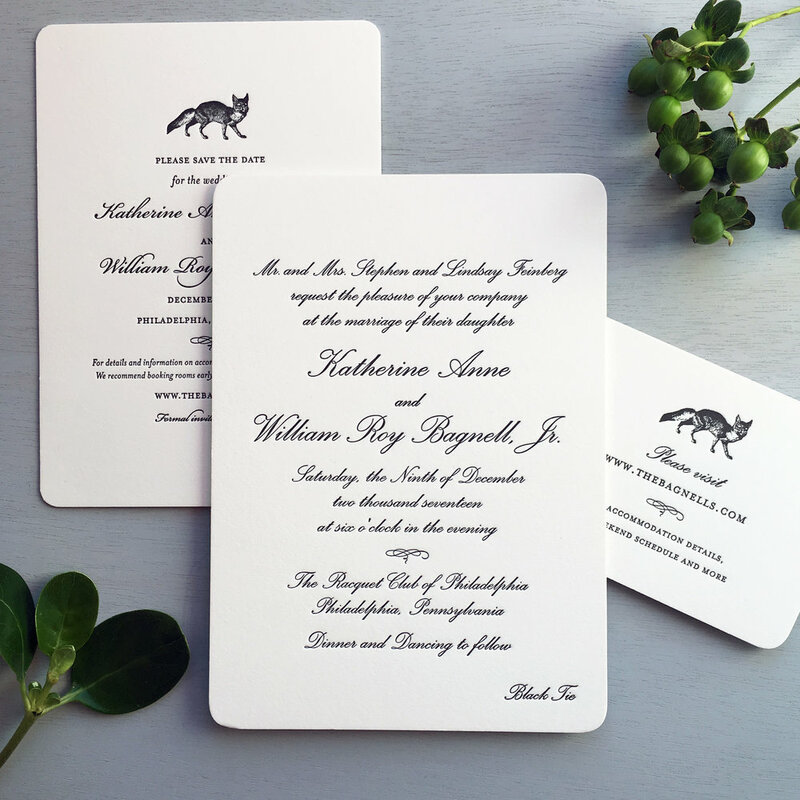 Sometimes the "Day-of" stationery gets lost in the shuffle with wedding planning but a full suite of menus, programs and welcome cards is a great way to carry the style of the invitations through to the actual wedding day celebration. 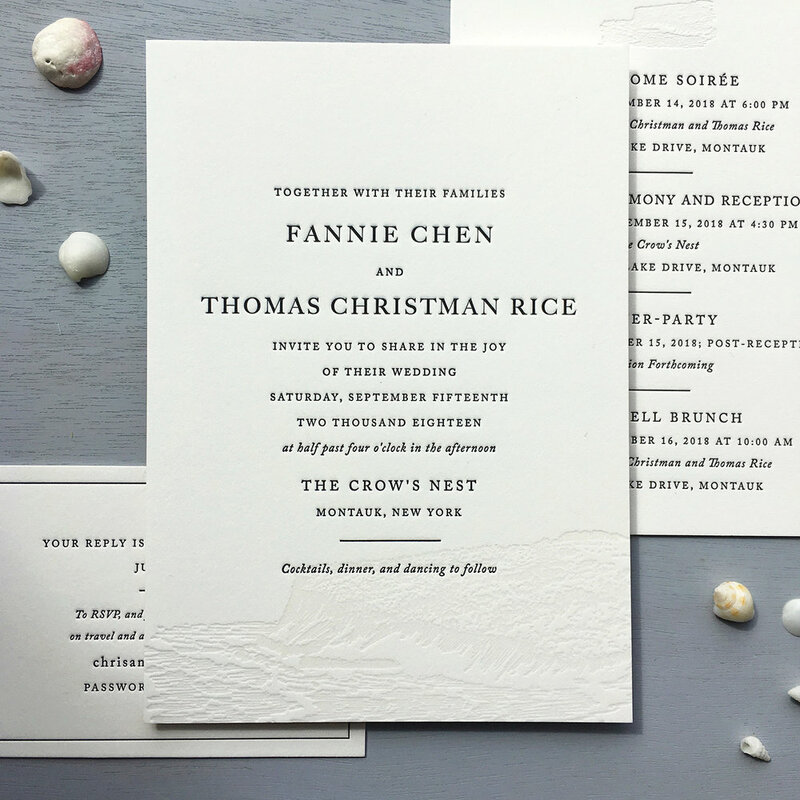 We're often asked about printing "blind", which means printing without any ink, so you just see the impression of an image or text. 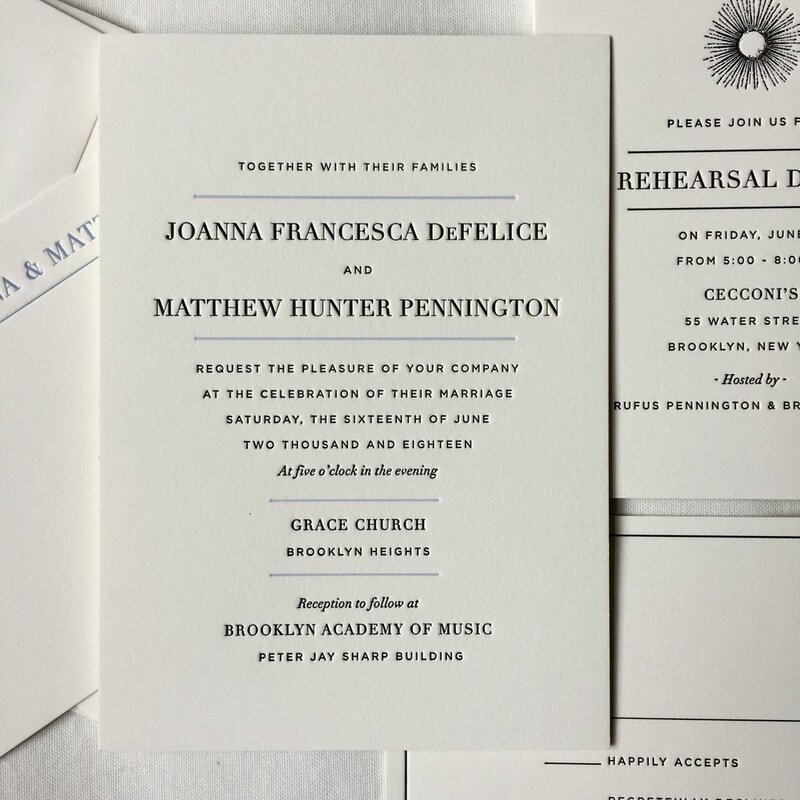 While the subtlety of a blind emboss is nice, we prefer to print a tinted emboss. 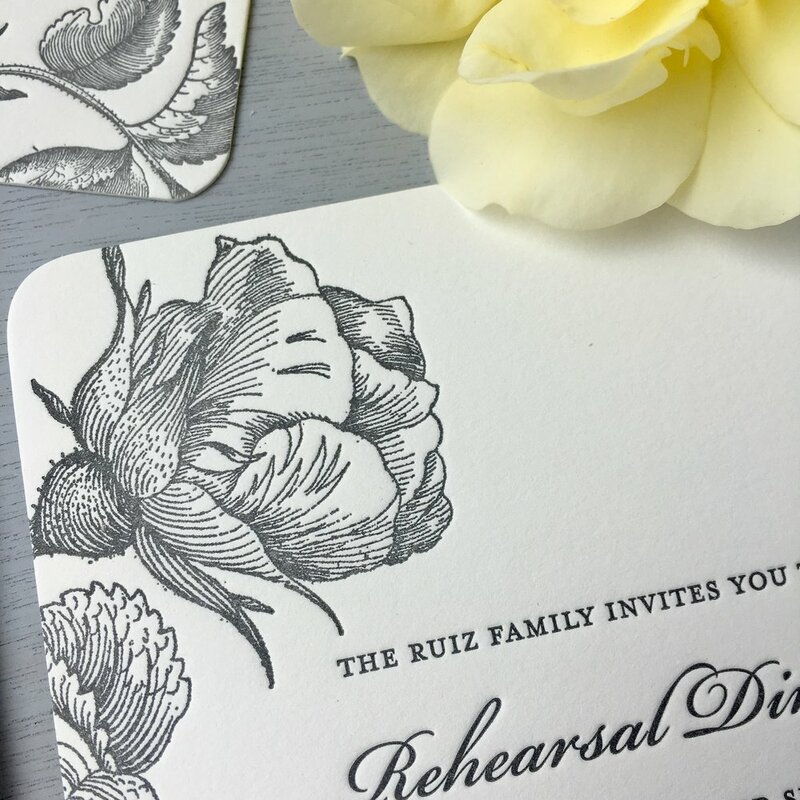 These photos illustrate the soft quality of an illustration printed with transparent ink, sized with a touch of gray ink. This small amount of ink helps to create a bit of a shadow on the paper, so that the image reads a little better, but doesn't interfere with the text. 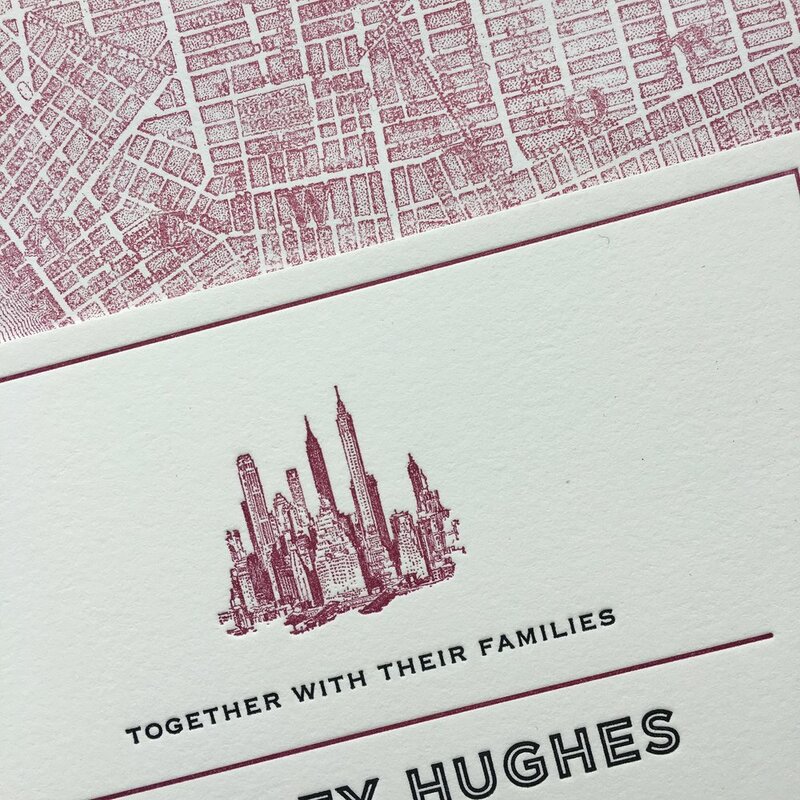 We've printed some lovely invitations for June weddings this year and are excited to share some of the designs here on the blog. 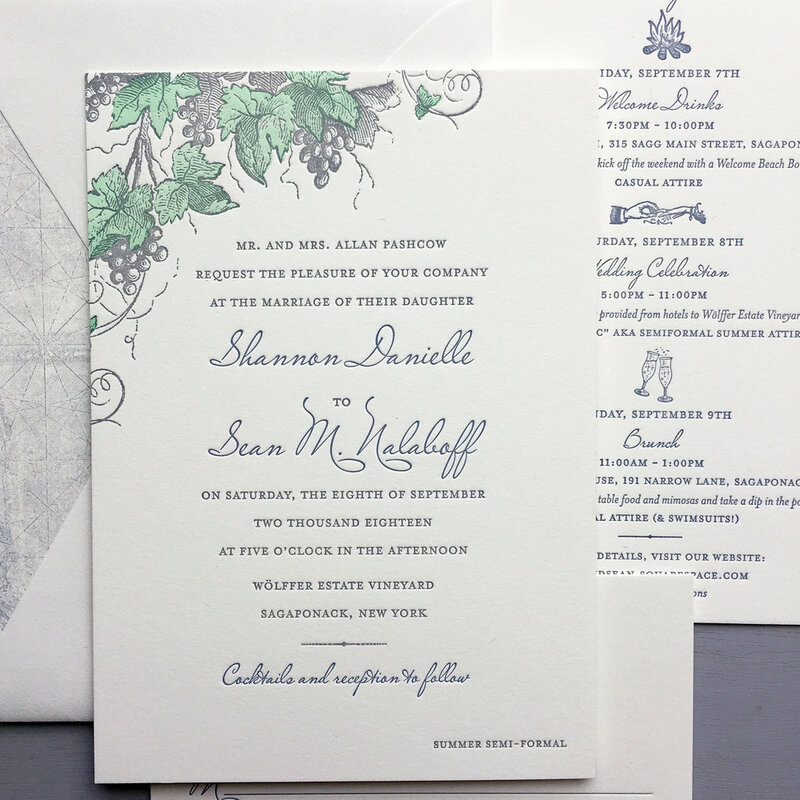 This is our Roses design for a wedding and reception at the boathouse in Central Park, here in NYC. 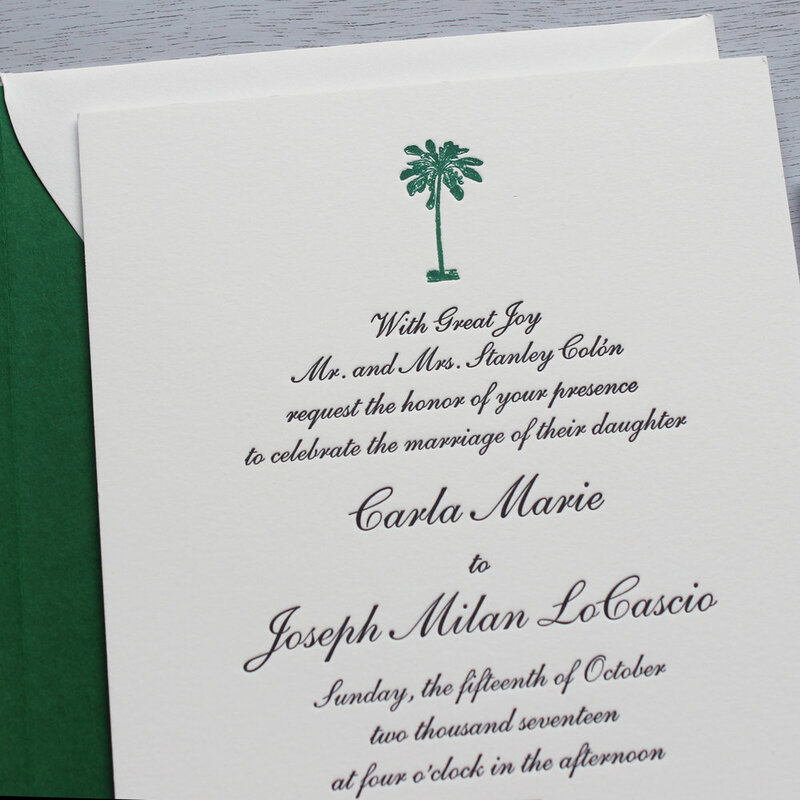 Congratulations to Joanne and Philip on their summer nuptials!